Both common sense and research point toward the basic principles of caring for perishable products such as Christmas trees. Almost any practice that keeps trees cooler, better hydrated, and in the dark will minimize moisture loss. 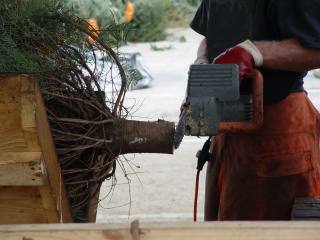 Practicality dictates a trade-off between ease of handling and those practices that maintain moisture inside cut trees. 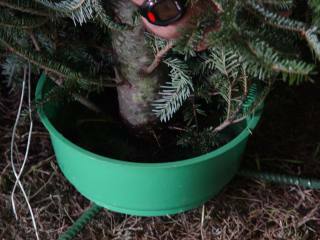 An ideal care package for Christmas trees would involve complete shade from the sun and proction from wind, irrigation or tree stands with water, and mulch under the trees where tree stands with water bowls are not in use. At the very least, the sod or mulch under trees should be watered regularly. 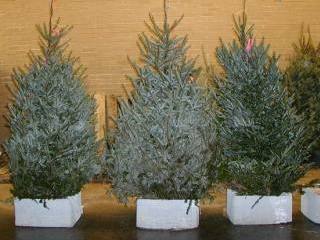 Ideal care would also include multiple deliveries of trees over the retail season to minimize the duration of storage and display. 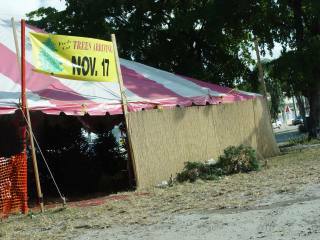 Perhaps most importantly, the initial delivery of trees to the retail lot would be delayed as long as possible in November to insure product freshness all the way to Christmas. Use a combination of existing site features and added practices to block exposure to sun and wind. Depending on your climate, even partial exposure could result in a loss of tree quality. Even a strip of sunlight in a southern location can result in a strip of sunscald across trees displayed without water. Use location, building features, or natural shade effectively. Avoid highly exposed, windy sites. Use the north side of a building and any overhangs. Don’t “make do” if existing shade is inadequate. Canopies, tents, awnings, and shade cloth can all make a difference in light, temperature, and humidity levels. Adding sides to a tent will block early and late sunlight and trap humidity in the tent that would otherwise be blown away by any breeze. The shade from trees may need to augmented where there are gaps or sun comes in from the sides. Leaving tarps or shade fabrics directly on piles of Christmas trees may be better than nothing but can trap heat and result in sunscald. If your shade is working, you should be able to feel a noticeable drop in temperature and an increase in humidity. Where daytime temperatures may reach the high 60°s, the addition of water becomes critical to retaining Christmas tree freshness. 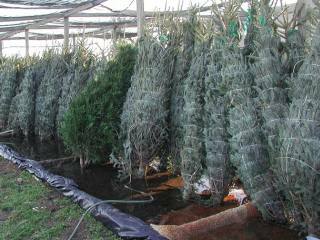 A fresh Christmas tree can lose more than half of its water content in a single day if exposed to drying conditions. Based on the NCSU retail survey, the frequency of watering is much more important than the type of irrigation. Any source of water was as good as another if it was provided frequently. Water at least daily. Where the frequency of watering decreased or became “as needed,” the freshness of trees diminished. Commercial tree stands provide an easy way to keep displayed trees in water. They also translate into another product to sell. The ground cover under your trees will make a big difference in how easy it is to manage temperature and humidity around your trees. If you can retain moisture under your trees, you can reduce temperature and increase humidity. Many surfaces work against keeping trees fresh. Asphalt or concrete pavements hold the heat while soil and grass stay cooler. Pavement also sheds water. By adding a layer of mulch on top of the pavement, you can keep some of the water on site and increase humidity around the trees. 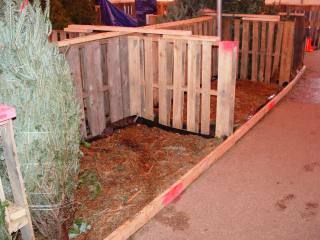 Some retailers have created shallow frames under their tree stalls with 2″ by 4″ berms and plastic to hold in mulch and water without disrupting the paths where people walk. Retailers have constructed water reservoirs or pools for either stored baled trees or trees displayed loose in bays. Simple wooden frames have been constructed from 2×4’s or landscape timbers. The reservoir frame is usually tied into the wall structure. The cavity is lined with one or two layers of plastic sheets. The plastic can be protected with mulch or scraps of old carpet. The pool is then flooded. If large reservoirs are created in storage areas, employees may want to wear rubber boots (yet another way to advertise the freshness of your product). While vital for tree freshness, extra water may be inappropriate in certain situations. Standing water or even tree stands with water are a problem where an extended hard freeze is expected. Northern retailers may need to eliminate irrigation altogether or only water under warm conditions. Also, holding too much water can be a problem on poorly drained soils that become muddy after rain. There are locations where reduced water applications using either tree stands with water bowls or 2″ by 4″ bermed pools would make much more sense than general watering. Christmas tree stumps become resin-coated and dirty as they are handled. This can block the uptake of water into the tree. Also, air bubbles can form in the wood at the face of the cut to further impede water entry. Left this way, even a fresh tree placed in water will dry out. To remove this barrier, make a fresh cut of about a 1/2 inch disk off the base of the tree trunk. A clean cut opens the ends of all the pores in the wood. If a tree is stored dry after the fresh cut is made, good water uptake can be expected for the first day or two when the tree is finally put in water. Water uptake will decline beyond that point. If a tree has been dry for more than 3 days, another fresh cut should be made. 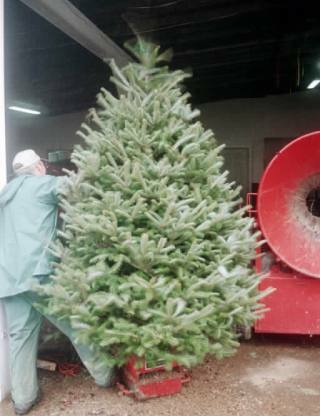 Ideally, as soon as the cut is made, the tree should be stored or displayed in water. The recommendations made thus far will increase or preserve the water content of cut Christmas trees. Using a tree shaker will not keep a tree fresh. However, a shaken tree is a cleaner tree that will provide a better consumer experience. Tree shaking will remove dust from the field, old needles, and any bugs that might be making a home in the tree. Many of the needles that shake out of a fresh Fraser fir will be old needles that dropped in the fall and lodged in branch joints. If a tree has a good hold on its needles, there is nothing like a tree shaker to prove it. Adding any new care practice will reduce your risk of being saddled with dry trees. However, keeping trees fresh really depends on consistent care. One day of exposure without water, one afternoon in a pile of trees on blacktop, repeated afternoons on the western side of a tent without sides — any of these situations will drain freshness from a tree. 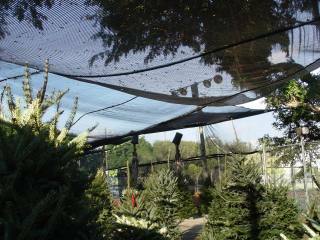 Make sure you close all the gaps in tree care so you can sell the trees as fresh as they came from the farm.